Last month we explored the history of the salon-hang style used in Gallery 10, which has been reopened as Mr. Layton’s Gallery. A glance around tells a lot about what kind of art was popular in the late 19th century in America: sculpture is clean, white marble; paintings by European and American artists fit into easily described categories (landscape, genre, still-life), or they are inspired by the classical past. There is nothing truly avant-garde here. No Courbet, no Manet, no Monet, no Gauguin. Most of this artwork stands firmly in the tradition of art as it was understood for centuries. In fact, Homer and His Guide may even have been a direct rebuttal to the type of artwork shown at the First Impressionist Exhibition of 1874. Bougereau’s powerful painting reflects the survival of the classical, in both poetry and art, while facing adversity. Although most of the beautiful objects from the early history of the Layton Art Collection are not ground-breaking, they are important to the time. And many of them still show the influence of the artists leading the attack on the art establishment. One of the small paintings on the east wall, right above The Woodgatherer, probably escapes your notice. 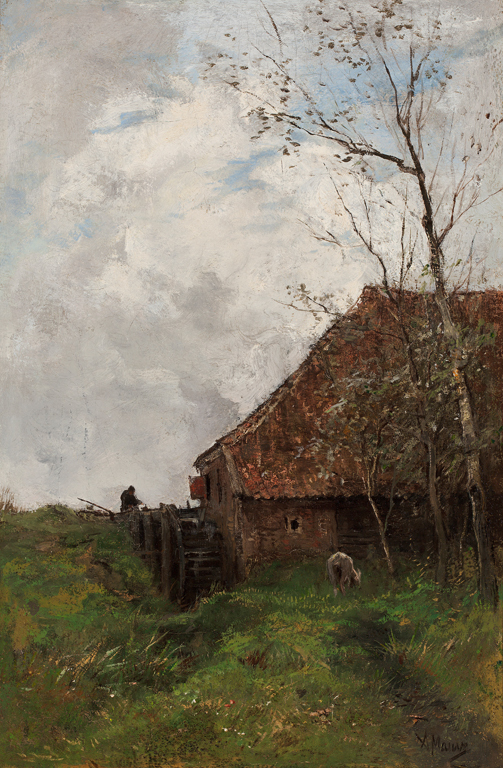 This vertical landscape, which shows a water mill in a field, was painted around 1880 by the Dutch artist Anton Mauve. Never heard of him? Not surprising. Although popular in America during the third quarter of the 19th century, he is certainly not a household name today. Mauve was one of the best Hague School painters, which was a group of 19th century Netherlandish artists who drew their subjects from 17th century Dutch masters, but their style from French Barbizon painters. This jewel of a painting takes a modest subject and makes it come alive with active brushwork and a warm depth of color. But what if I told you that it was Mauve taught Vinent van Gogh (Dutch, 1853-1890) to paint? After various other careers, Van Gogh decided to become an artist and taught himself to draw. But he wanted to paint, too, and his cousin’s husband was an artist: that artist was Anton Mauve. For three weeks in the winter of 1881-82, Van Gogh worked in Mauve’s studio. On the same wall, in the lower right corner, is a lovely painting called The Forester’s Family by Thomas Faed. Faed was a star in the 19th century art scene–it has been said that he did for Scottish art what Robert Burns did for Scottish song. Faed shot to fame in 1855 when his painting The Mitherless Bairn was shown at the Royal Academy in London. A critical and popular success, this painting was praised for its meaningful narrative, artfully composed with touching details of the cottage interior and expressive faces drawn from Faed’s own childhood. 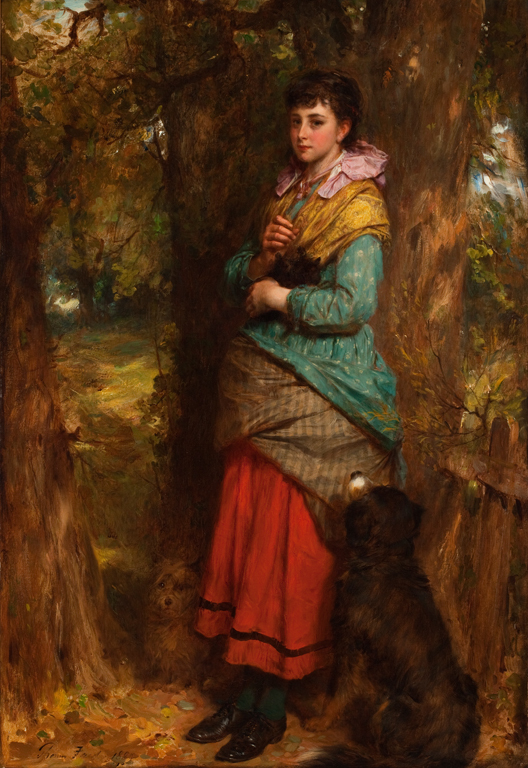 In the Museum’s painting, a girl dressed in country attire leans against a tree in a dense forest. Presumably, the forester referenced in the title is her father, who would have been in charge of maintaining the trees (from planting to felling) for a landowner, who would sell the wood as a source of income–an important industry in Scotland. Clearly, this is a nationalistic subject that Faed would have wanted to promote. An additional sentimental touch is the two devoted dogs that stand to either side of the girl, as well as the puppy she holds in her arms. The British loved their dogs, and in the 19th century it was common to show them with human-like personalities or record them with portraits of their own, such as our Portrait of a Terrier by Edwin Landseer. It is obvious that the title The Forester’s Family doesn’t just refer to the human in the painting! The Layton Collection has three fantastic paintings by Edward William Cooke, which are all on view on the east wall: Venice, Bonchurch, and The Pilot Boat, above. A maritime painter who looked to the 17th century Dutch artist Willem van de Velde for inspiration and traveled widely to look for subjects, Cooke was very popular in England and in America. The Pilot Boat is the largest of these three paintings and the most dramatic. The pilot is the person at the seaport who assists the ship in navigating the shallow waters between sea and shore, and a pilot boat is a small boat that was used to transport that pilot from port to ship. 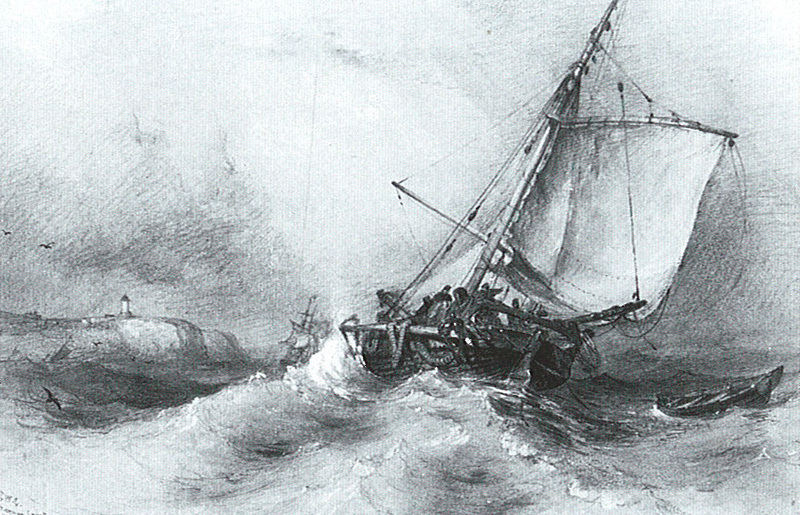 You can see here the crew battling the wind and waves to get out to sea. 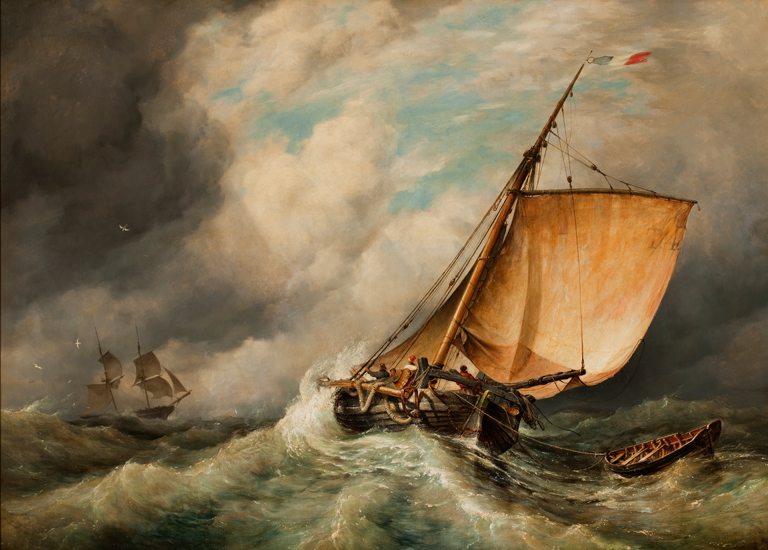 Edward William Cooke, Trouville fishing boat on larboard tack in rough sea, 1839. Watercolor Private Collection. Photo courtesy of the Martyn Gregory Gallery, London. Dr. Munday then lists the entry for this painting, and that the location is unknown. But… the painting has the exact dimensions of our painting. So, the missing painting is ours! In previous blog posts, I’ve been able to illustrate how having a museum’s collection on the web is so important to research. 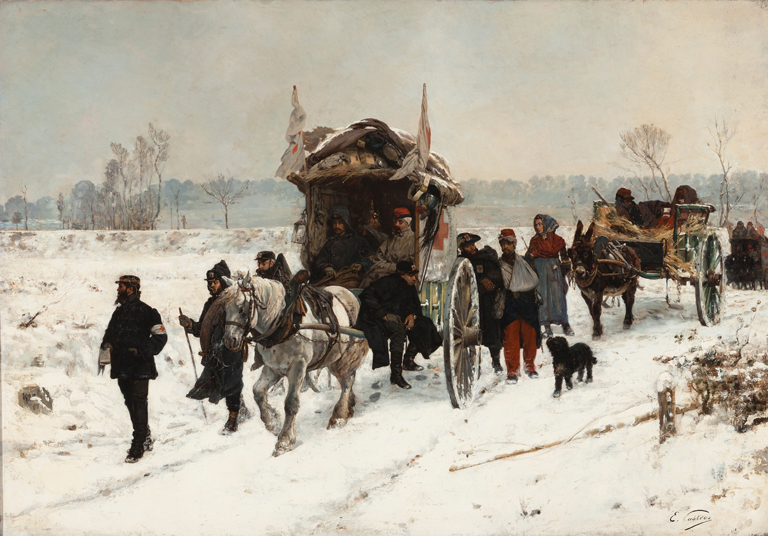 I had always thought of Convoy of the Wounded as a beautiful painting, but about a year ago I found out more information about it that makes it really special. It’s now on view on the south wall of Gallery 10, at the upper right corner of the doorway. Last year, we were contacted by an art dealer in Switzerland who was selling an oil sketch of a painting that Castres had shown at the Salon of 1872, and which won a silver medal. By searching on the internet, he found the painting in our collection database and contacted us. What is really fascinating about our painting is that it is the first representation of a Red Cross ambulance in history. The Red Cross was formed in 1863 in Geneva, Switzlerand, and was still developing its role when the Franco-Prussian War began. Castres, a trained artist, signed up with the Red Cross and continued to sketch during his service. He created many heartbreaking scenes of what he saw. Castres, who witnessed the war first hand as part of the aid through the Red Cross, was asked in 1880 to construct a panorama to document the devastation. The panorama was on display in Geneva, Switzerland, until 1889, when it moved to the city of Lucerne and is still on view (although the top and bottom have been cropped). Here is a complete view of the panorama. You can read more about this time here. Castres even seems to have included himself in the painting, as the bearded man at the far left. On the east wall, just to the left of Homer and His Guide, is a striking portrait of Mrs. Christian Wahl. Antonia Wahl and her husband, Milwaukee businessman Christian Wahl, were German immigrants. His most important civic role was as the first president of the Milwaukee Park Commission, where he was instrumental in not only getting Frederick Law Olmstead to design Lake Park, but also ensured that Milwaukee would have many more parks throughout the city. Wahl Avenue, which runs along Lake Park, as well as Wahl Park, are named for him. 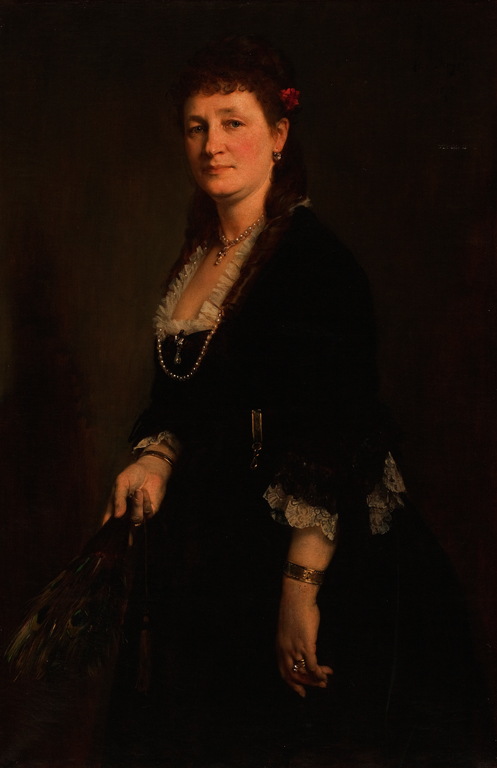 The artist who painted Mrs. Wahl as a pleasant and fashionably-dressed lady of Milwaukee was Heinrich von Angeli. An Austrian who specialized in portraits, Angeli was sought after by the courts of Europe. His patrons ranged from Queen Victoria to Kaiser Franz Joseph to Grand Duchess Alexandra of Russia. This work is probably one of the most unusual paintings on view in the gallery is on the north wall! In a masterful composition, the German artist Paul Friedrich Meyerheim shows eight monkeys at a banquet. 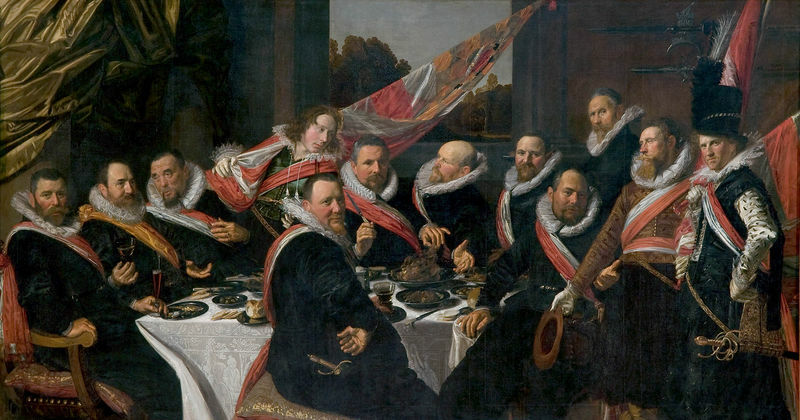 The monkeys wear fancy trappings—coats, cuffs, and hats with plumes—and sit at a majestic table set with wine on an expensive marble floor, reminiscent of paintings such as Frans Hals’s Officers of the St. George Civic Guard of Haarlem. It is clear, however, that the party has degenerated into a free-for-all. It doesn’t take much analysis to realize that Meyerheim has used monkeys to lampoon the actions of humans. The title of Meyerheim’s painting, however, shows that there is more to the interpretation. In 1859, Charles Darwin’s On the Origin of the Species was published. The painting is dated just six years later. The flurry of discussion on evolution–and the extrapolation that humans developed from apes, which Darwin wrote about in 1871’s The Decent of Man–led to various visual interpretations of the theory. Many of them were satirical cartoons, particularly of Darwin himself. But other artists took the use of monkey in art one step further and make comments on the human actions of the day. In this painting, Meyerheim pokes fun at the gatherings of the 19th century, when things were not done until they were overdone. A “Club Man” refers to social clubs, where a man would go to socialize with other men with similar interests. These well-off men are obviously not the upstanding citizens they pretend to be! I only had room here to talk about six of the paintings freshly out on view for Mr. Layton’s Gallery, but I think that you can see that there are many interesting stories to be told. This entry was posted in Art, Curatorial and tagged 19th Century Art, Layton, Layton Art Collection, Salon-style. Bookmark the permalink. on the Layton Collection, which led me to read her blog. I want to comment on the Meyerheim painting — “A Darwinian Prehistoric Social Party (The Un-Evolved Club Man of the Period)” — what a great title ! I began to wonder what title Meyerheim actually gave to this painting, probably a German title, right? Or has someone else created this title ? An auction house ? A collector ? A scholar? to comment on Darwin. Or did Meyerheim just have fun painting monkeys ? I notice that he produced other monkey paintings in the 1860’s and later. Size	Height 24 in. ; Width 62 in. / Height 61 cm. ; Width 157.5 cm. Size	Height 9.5 in. ; Width 15 in. / Height 24.2 cm. ; Width 38.1 cm. Size	Height 9.3 in. ; Width 14.8 in. / Height 23.5 cm. ; Width 37.5 cm. Size	Height 14.2 in. ; Width 16.1 in. / Height 36 cm. ; Width 41 cm. Size	Height 21.7 in. ; Width 45.7 in. / Height 55 cm. ; Width 116 cm. Size	Height 23.7 in. ; Width 62.2 in. / Height 60.3 cm. ; Width 158.1 cm. Size	Height 19 in. ; Width 23 in. / Height 48.2 cm. ; Width 58.4 cm. Size	Height 14.3 in. ; Width 11.1 in. / Height 36.3 cm. ; Width 28.3 cm. And I also found a reference to an 1881 work titled “Affenakademie” [ Monkey academy ] . . .
Holzstich von Bothe nach Gemälde von Paul Meyerheim gezeichnet von F. Friese. 1881. 23,7 x 35,5 cm. Thank you, Mr. Van Uxem! This is very interesting information. I will look into the German title of the painting and let you know what I find.